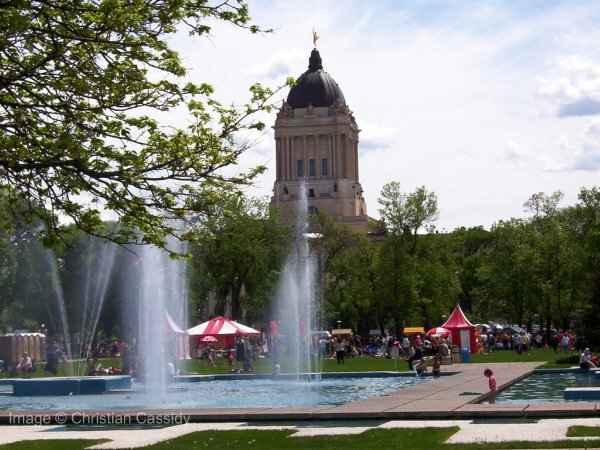 Memorial Park is Manitoba’s smallest provincial park located in downtown Winnipeg north of the Legislative Building. In 1961, the City of Winnipeg signed over to the province 4.5 acres of land it already owned along Memorial Boulevard. The province combined that with land that it owned, the original University of Manitoba campus, across from the Legislature. On 28 September 1962, the Park and City Hydro Fountain were dedicated by Premier Duff Roblin. Memorial Park contains a number of monuments, including the Winnipeg Cenotaph, Peacekeeper Monument, Airmen in Training, Sir William Stephenson, and Women of the British Commonwealth. Provincial Parks, Province of Manitoba. Memorial Park, Winnipeg Downtown Places. Information for this page was collected and prepared by Christian Cassidy.